Cleaning out your horse’s hooves is an essential part of horse care and it needs to be done frequently. It’s important for several reasons. The concave shape of a horse’s hooves and the two clefts beside the frog can easily pick up debris that could injure the horse’s hoof. It's not unusual to pick rocks, pine cones, and twigs out of a horse’s hooves, and although a pine cone probably won't cause damage, rocks and twigs certainly can. Nails, bits of wire, glass, and other sharp objects can pierce the sole or cause bruising. If your horse is suddenly lame for no obvious reason, the first thing you should do is clean out its hooves and look for a foreign object, bruise, or puncture that might explain the lameness. Manure and soil left in the hoof can create a damp, dirty environment that makes an ideal place for thrush to start. Keeping the hoof cleaned out may help prevent thrush from starting. Once thrush does set in, frequent cleaning can help it from getting worse, and any thrush remedy you are using can be applied without drawing more dirt into the area. Getting a good look at the bottom of the hoof helps you assess when your horse’s hooves need trimming or shoes need resetting. 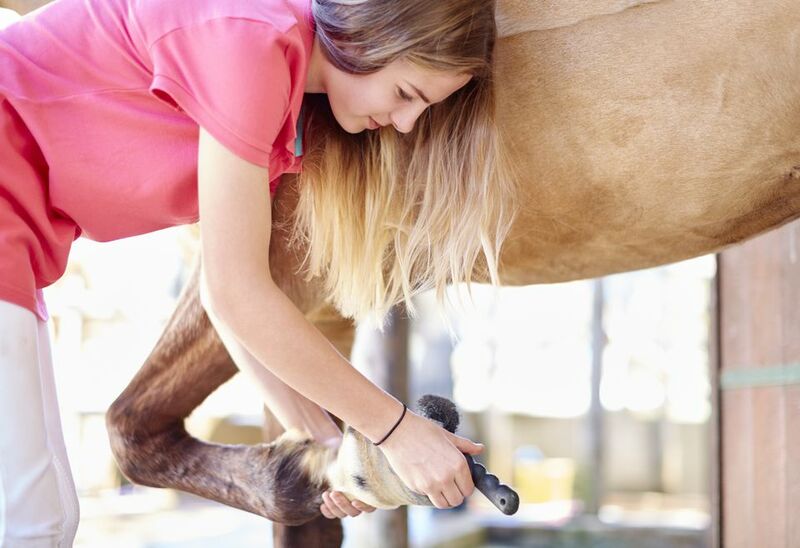 You’re also more likely to notice if a shoe is loose as you clean out your horse’s hooves. You may also notice things like separated laminae, heels that are getting shallow or contracted, soles that are changing and other problems that evolve slowly, but can be solved easily if caught in time. Hoof cleaning time is a good time to assess the overall health of your horse’s foot. Start picking out your horse’s hooves by having it tied safely. Cross ties may be safer because they keep you away from posts and walls you could get knocked into if your horse acts up. Most people start on the front near side. Your horse should be taught to lift its foot willingly. There are several ways to cue the horse. Some people tap on the chestnut. Some may twist or pull up on the chestnut, but that shouldn't be necessary. Others pinch lightly just above the pastern joint, along the tendon at the back. The horse should pick its foot up, allowing you to support the hoof in one hand—usually, the left if you’re right-handed. The other hand handles the hoof pick. Use the hoof pick to clear out dirt, matted hay or straw, manure, and any other debris. Work from heel to toe, paying careful attention to the cleft around the frog. A stiff brush, which some hoof picks have attached, is nice for brushing away the bits of dirt and chaff. You might like an illuminated hoof pick for getting a good look at the nooks and crannies that are hard to see if the light isn’t good. Clean off the sole, and pick gently around the area of the hoof just to the inside of the hoof wall. This is the white line, and you don’t want to jab into this area, as it’s a bit softer than the rest of the hoof. But this can be an entry point for things like grit and small stones, which can lead to seedy toe or white line disease. The frog also is softer and more sensitive, so be careful not to pick too aggressively in this area. Hoof cleaning should be a part of your daily routine, and along with a clean environment, healthy diet, and the regular attention of a farrier ​contributes greatly to hoof health.